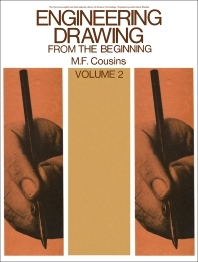 Engineering Drawing from the Beginning, Volume 2 discusses the methods for communicating technical engineering concepts through illustrations and drawings. This volume covers the more advance techniques in engineering drawing. The coverage of the text includes the helix, which is the path traced by a point moving uniformly around the surface of a right cylinder that is moving axially. The book also covers drawings of solid objects such as prisms, pyramids, and cones, along with hollow objects made from sheet material. In Chapter 5, the text presents the conventional representations of common features. The sixth chapter deals with all forms of fastenings, while the seventh chapter talks about metrication in the drawing office. The last chapter details the working drawings of assemblies and parts taken from those assemblies. The text will be most useful to students and professional engineers, as both learning material and reference source. 8.84 Assignment A. Assembly Drawings for Flanged Offset!